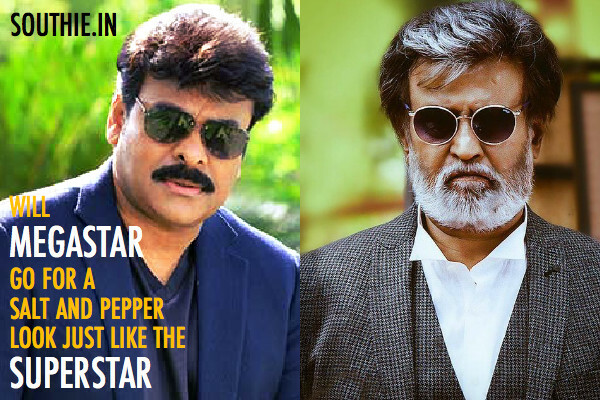 Can Chiranjeevi Don a Salt and Pepper Look like Rajinikanth? Home/NEWS/Can Chiranjeevi Don a Salt and Pepper Look like Rajinikanth? Can Chiranjeevi Don a Salt and Pepper Look like Rajinikanth? Megastar Chiranjeevi’s 150th movie is the most awaited comeback that the fans await. Can we see Megastar in the most stylish avatar just like Rajinikanth. Megastar Chiranjeevi’s much awaited 150th movie is still to get on as Puri Jagannadh and V V Vinayak have most probably been ruled out. Where as Rajinikanth is coming up with Kabali after the disastrous performance of Lingaa. Rajinikanth is at a last playing his age and the look of the superstar has been much appreciated in the photos that have been released. Chiranjeevi in his latest photoshoot and other places doesn’t look his age, but will we get to see him any time doing a salt and pepper look? He also needs to lose some weight if he has to look good and perform well on screen.